Khadi Pure Gramodyog Herbal Rose & Honey soap is rich in Rose extract, which caresses the skin making it softer and relaxed. Rose is calming, uplifting and is beneficial in stress related conditions like insomnia and nervous tension. 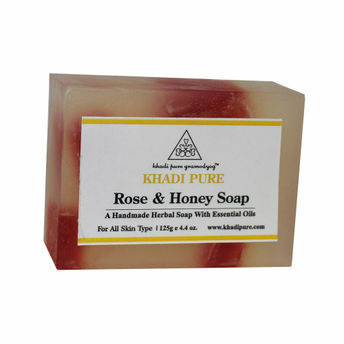 Honey has anti-microbial properties and is known to treat minor skin irritations and sun burns. It is an excellent additive to skin care products due to the ability to retain water. It is a great defence against skin damage and aging because of the antioxidant properties of Honey. It also helps to fight against damage caused by the sun's UV rays.